For such a small country and population (about 10 million) the Czechs have managed to produce many great people, especially in the arts. 2011 gave me reason to praise two of them. the animator and film maker, who at 78 is not only going strong but has just managed to release his best film to date, Surviving Life. This is a superb, darkly comic story of a man’s problems with the women in his life, and his troubled recourse to psychotherapy. It is also deeply moving and emotionally honest. And all told through thousands and thousands of animated paper cuts. Brilliant. Švankmajer’s body of work shows us the enduring vitality and potential within surrealism – fulfilling the early Surrealists hopes and aims for the movement, harnessing both the dynamism of politics and desire for change and psychology. Surrealism lives. 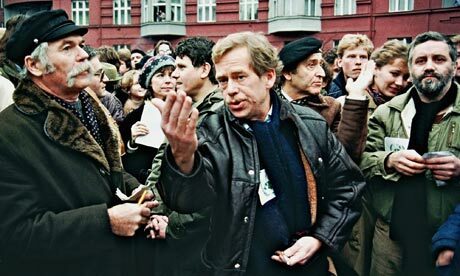 Václav Havel the former Czech president, who died this year, was never really a politician. He was put into that position through his determined and dogged pursuit of human rights and artistic freedom in Communist era Czechosolvakia. A poet and playwright, Havel fought for art and the right of people to have art that is honest and true and life enhancing. He fought for intellectual freedom for writers and for ordinary people. Through this, his fight became bigger and wider and he became a figurehead not only for his own country, but for a movement that is still alive and well and gaining strength. Havel cannot be blamed for the ravages of “free-market” ideology that invaded the former Eastern bloc after the fall of Communism, which sadly has been the thrust of few nasty obits that appeared recently. I know about that, because I was there. I was in Czechoslovakia in 1990 and again in the mid 90s several times, and in Russia. On thing I noticed, apart from people being very glad to energetically express themselves freely – in the street as well as in print and in art, was the number of “economic advisers” from US multinationals and universities that were present in the capitals, living life high on the hog, “advising” the new democracies how to take their economies out of communism (by privatising then selling everything cut price). And evangelical Christian groups intent on saving previously atheistic souls. Often these seemed to be hand in glove if not hand in hand. I know because I saw them congregating – in hotels I was staying in and restaurants there I ate. As I was “one of them” they made no secret of their aims, regaling me freely with their plans for total renovation of these benighted states. The evangelicals did not get very far, but the neocons did, which is why Russia is run by oligarchs and there are almost no Czechs in central Prague. But this was not Havel’s fault: he, like the rest of us, did not realise what the game was, and so like all of us, could be said to have sleepwalked into the kind of oligarchic dictatorship of extreme market capitalism that we have now. Havel’s legacy as a champion of freedom of expression and freedom from tyranny, will endure, as will his commitment to nonviolent change.